I've been watching a lot of Frasier recently. I've watched the whole series at least twice, and I'm currently making a third lap. My favourite comedy, up till now, has been The Office (American version). Now I think that it would have to share the honours with Frasier. I'd avoided watching Frasier for years, because I assumed the show itself would be as pretentious and upper-middle-class as its protagonist. I didn't realize that the humour is often quite broad and farcical, and that the snootiness of the two central characters isn't typical of the whole cast. Interestingly, one of the minor characters, a smug food critic named Gil Chesterton, was based on a real person called Gilbert Chesterton-- a teacher of journalism, as it happens. At this stage, for the sake of anyone who is completely lost, here is a lesson in comedy TV history. Cheers was an American sit-com which ran from 1982-1993, set in a bar in Boston. It was wildly successful, although it took a while to win the audience over. The character of Frasier Crane was a rather pretentious psychiatrist, a habitué at the bar. He got his own show in Frasier, which ran from 1993 to 2004. In this series, he has moved to Seattle and has his own radio show. Some people prefer Cheers to Frasier, but I think Frasier is clearly superior, though Cheers is also good. I started watching Cheers because I had a hankering for a very low-concept, down-to-earth situation comedy, one as close to the routines of ordinary life as possible. And Cheers is certainly that. But I was somewhat disappointed, because a lot of the humour is very mean-spirited. I suppose what I was looking for in Cheers was a thicker concentration of something I already find in ordinary life, in the sights and sounds of the city: a sense of the eternal in the everyday. We know that this world of lamp-posts and taxis and sports results is not going to go on forever, that one day it will be as utterly dead as ancient Rome. But it feels as though it will go on forever, and there's a certain comfort in that. Anything that you cannot see to the end of is effectively infinite. I like to lose myself in the rhythms of the workaday world, to escape from myself, to become "depersonalised" in a pleasantly anaesthetic way. There are some images and atmospheres which particularly induce this state of mind, for me. 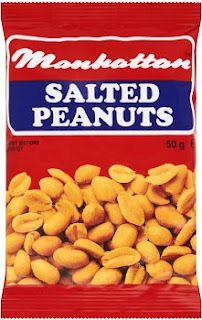 Strangely, the design of the Manhattan peanuts packet (an Irish brand) is one of them. In another way, however, I find the very format of situation comedies profoundly soothing. The world of a situation comedy is a deliciously insulated world. Primarily this is because of the format. Every episode exists within a "frame" of half an hour or so. All the problems and complications of the plot will be resolved by then, and things will go back to normal. "Status Quo is God", as TV Tropes puts it. Why should I find this comforting? I suppose I'm just the kind of person who has always found transience particularly disturbing. I remember, in school, an English teacher in school writing the word "transience" on the blackboard, during a discussion of Keats's poetry. It was a few weeks before the end of my schooling. I stared at the word, realizing that it was simply a word written in chalk, but that in a few weeks I would leave the school and that part of my life behind forever. The word seemed to crouch there like a poisoned snake. I remember how the summer sunlight glowed on the chalk. But situation comedies are comforting other reasons, too. I like the "wheel of fortune" aspect of situation comedies-- at least, the warmer and more upbeat situation comedies. 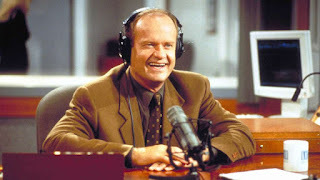 (And Frasier is pretty warm and upbeat.) In any given episode, at least one of the characters is going to be having a particular run of luck, or a particularly good run of luck-- but it's always a passing thing. Of course, when they are down, every possible laugh is milked from it-- the crowded room falls silent before they drop their clanger, the microphone picks up their embarrassing confession, the person they tried to impress by a feigned knowledge of French literature turns out to be an expert in the subject, and so forth. Strangely, such comedic exaggerations make our own humiliations feel all the better for being acute-- nothing by halves, right? And besides, the message is that the wheel of fortune always turns again. Another thing I like about situation comedies is the way the characters always respect each other, deep down. (Again, I'm talking about more or less sentimental shows here.) They'll laugh at each others' mishaps and indignities, they'll feud, they'll seek to outdo each other, they'll be maddeningly obtuse at times...but, ultimately, they are always there for each other. And more than that: they recognize each other's quirks and individuality (even if it's only by grumbling about them). In Cheers, when one particular character walks into the bar, everyone always shouts: "Norm!". There's something very appealing about that. There are particular plot types of sit-coms that I especially relish, and find especially comforting. For instance, the "sick day" episode, when somebody is laid up sick. It's quite cosy. Or any episode where events are told from several different perspectives (called a "Rashomon plot"). Or any "framed" narrative-- for instance, one of the characters telling an old story, which is then "seen in flashback". That seems even more "insulated". A "trip down memory lane" episode is a particularly cosy example of this-- for instance, "The One with All the Thanksgivings" from Friends. 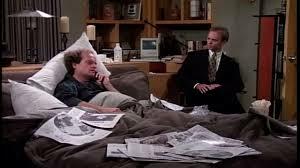 Most "insulated" of all is any plot involving a dream-- for instance, "The Impossible Dream" in Frasier, where Fraiser is puzzled throughout the episode by a recurring dream. As I finish this post, it occurs to me that it might be far too revelatory. How neurotic, how insecure, must I be, to take such comfort (a word I have used several times) in the fairy tale stability of situation comedies? But there you have it. After all, what is a blog without the occasional eccentric post such as this? Has the 'phone screen mode ' no longer available? It's a bit hard to read the bigger layout on a phone screen. I don't know whether this is a real comment or a spam comment. I haven't done anything with the blog format as far as I know. But certainly, I've stopped being notified about comments, so maybe something has changed without me doing anything.